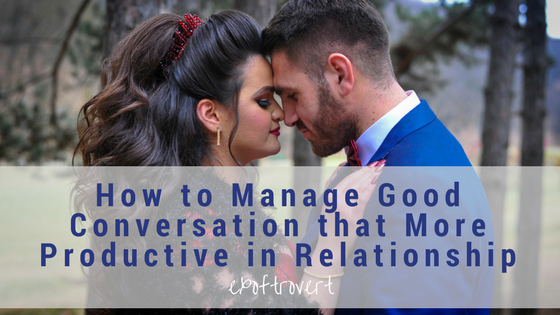 How to Manage Good Conversation that More Productive in Relationship - There are times when it's easy for us to engage in a conversation that leads to an argument. For example with your relatives or your spouse. The initial conversation turned out to turn into argument, judgment, or hoist the mistakes of the past. Of course, everyone who can speak that they do not master is the ability to speak productively, especially conversations between lovers or households. Here I write some tips, quoted from psychologytoday, how to manage a good conversation and more productive. Determining the purpose of the conversation. Lots of conversations. Determining the purpose of the conversation from the beginning will save energy as well as will be more focused. Basically, the conversation is just like driving a car. You must specify the destination first before starting. Set aside a little time to find out what the purpose of your conversation is and tell the other person, say, "I want to talk about the difficulties I face in the office." or "I want to explain why I was angry last night." By informing the other person what you need and what the clear purpose of your conversation is, will make the other person more focused on what he will say. Stay on the track. Just like driving a car, you have to keep it on the road. If your conversation goes well, then keep it going. Avoid the desire to give many examples, side topics, background problems and others. Focus on the present and what you want to say. Less is more is the most appropriate expression to make a conversation run smoothly and more productively. Tracking emotions. There are times in the midst of emotional conversations will change. The sound volume will also go up and down. Or it could be that conversation will move on to another topic. Usually, this will only increase the emotion rather than solve the problem. It's time to hit the brakes. Pause for a moment. Refrain from the urge to look for more information that will aggravate your emotions. Time to take a deep breath and calm yourself for a moment. If you start to feel that you're both upset and unable to control it, never say that your partner is getting angry or upset, on the contrary, just admit that you are feeling angry or upset. By saying "I'm getting angry" or "I'm getting annoyed" you can stop talking and take a little time to calm down. Having a speaking skill has nothing to do with your personality but it's a skill that can be learned and practiced. At first, you will not do it as well as you expected, you will repeat old habits. But no matter, you can try again and do the best you can do at any time.